South Bend, IN. 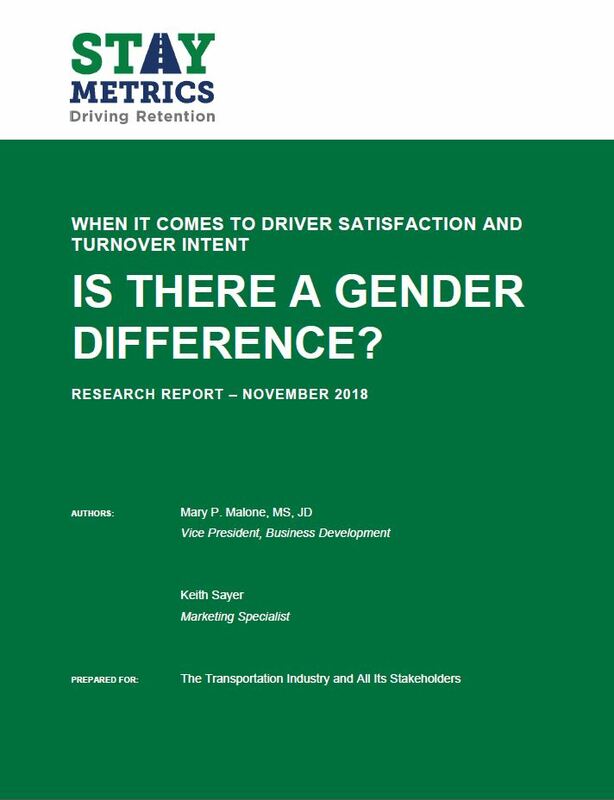 November 13 — Stay Metrics, the leading provider of evidence-based driver feedback, engagement, training, and retention solutions for the transportation industry, published a new research paper that attributes critical areas of driver job satisfaction and turnover intent to gender. Industry leaders have been emphasizing the need to recruit and retain more women as a solution to the driver shortage, which is expected to reach 63,000 in 2018. The Women in Trucking Association has an index that tracks the percentage of female drivers in the workforce. In early 2018 the index was just under eight percent. Using its extensive research database, Stay Metrics analyzed responses from nearly 16,000 drivers who completed the survey from January 1, 2017, to July 31, 2018. 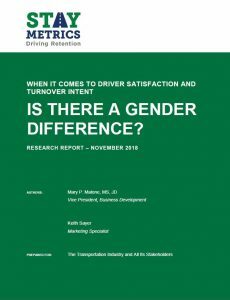 Stay Metrics’ clients consistently outperform the industry in driver retention and have a higher percentage of female drivers, on average. In the research sample, 11 percent of the drivers were female. Now we’re learning more about why we should focus on bringing more women into the industry, not just to fill seats, but to fill them with capable and well-trained drivers. “Ten years ago carriers often claimed they didn’t care about the gender (race, age) of the driver. Now we’re learning more about why we should focus on bringing more women into the industry, not just to fill seats, but to fill them with capable and well-trained drivers,” said Ellen Voie, President, and CEO of the Women in Trucking Association. Stay Metrics’ industry-leading suite of driver-lifecycle feedback interviews and surveys, combined with advanced data analytics, helps carriers understand driver behaviors and attitudes related to driver retention. Stay Metrics offers a unique custom-branded loyalty rewards program to recognize driver performance on key metrics. The engagement platform also serves as a communication and resources hub for drivers, in addition to supporting DRIVE SAFE and DRIVE FIT training modules. Stay Metrics is based at Innovation Park at the University of Notre Dame in South Bend, IN, and was recently named a “Best Place to Work in Michiana” by the South Bend Tribune.